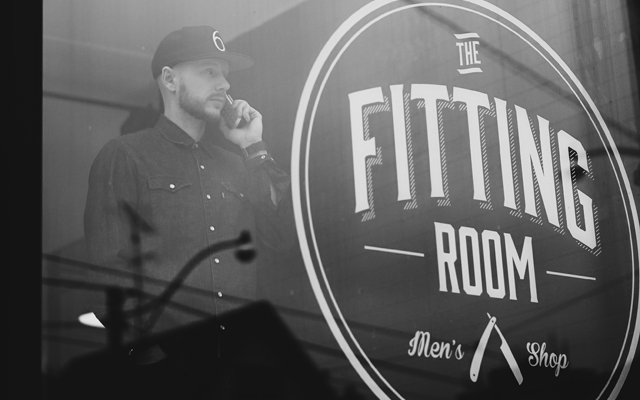 Located on quiet yet burgeoning section of Dundas Street West is The Fitting Room, Toronto’s latest barbershop. Opened last November, this new kid on the block seeks to not only give guys cuts and shaves so fresh and so clean to make Outkast jealous, but to blend the city’s culture and style into one cool and harmonious spot. The idea to start this cut and culture shop was struck between Bryan Brock and Brian Cafua, owners of The Fitting Room. Brock is a successful entrepreneur and creative director of the popular website 1LOVETO. Brian Cafua is his long-time barber and holds the title of Master Barber, who has Edward Scissorshands-like skills which lend to the mastery and art of cutting hair. “Regular house calls turned into ideas followed by meetings where my artistic touch and Brock’s creative vision meshed together to create our brand fitting for every man’s lifestyle” said Cafua. And rightly so, their combined talents prove to be a perfect fit where their clients can get a cut and shave, as well as socialize and network at monthly community events held onsite and view the works of emerging artists on the shop’s gallery wall. When you first walk up to The Fitting Room’s front door your eyes immediately fall to the vintage Koken barber chair that sits in its windows. Discovered online from an antique collector, this eye catching piece of furniture immediately sets the mood, tone and character of barbershop, as well as sparks conversation between barbers and their clients; and yes, you can get a cut in said chair. Inside, each barber station has the ability to become its own dedicated area – with the use of drapes – so barbers can conduct one-on-one consultations in private or it can remain open like a traditional barbershop set up. “Our barbers possess a diverse set of skills that have our clients walking out of the shop feeling ‘fitted’ and fresh. We offer the tightest fades, seamless straight razor shaves or even a classic scissor cut depending on your style” said Cafua. Services offered by the shop range from $20 for a line-up to $65 for a haircut and hot towel shave. Make your way past the row of barber chairs there is a small men’s lounge in the back, complete with big screen TV and a curated selection of fashion and lifestyle items for purchase. “We also offer more than just a cut or shave, we offer a unique collection of curated goods ranging from local artisans such as Vitaly, Rebels Refinery, Yo Sox, Brimz and even men’s grooming essentials from Baxter of California” said Brock.